There is no weakness technically on the Nifty EOD’s Chart, However if we will look into the 15 mins timeframe with wolfe wave study applied over the charts the prediction levels for nifty comes to 5982. Current market sentiment is heavily bullish in nature. But Wolfe wave clearly tells that one more swift downfall is due on the shorter timeframe . And EOD Chart “Rising Wedge Pattern” suggesting that a expanding triangle is now taking place from 6067 to 6002. 1)As per wolfe wave study 6064.15+6004.25/2= 6034.20-6066.85-6020.25/2=23.3 Roughly 6011 spot will be swing reversal point. 2) Wolfe wave 2nd and 4th Wave are noting but parallel waves. 4th wave is currently running on and the 5th wolfe wave is likely to target 5982 spot zone on intraday basis. 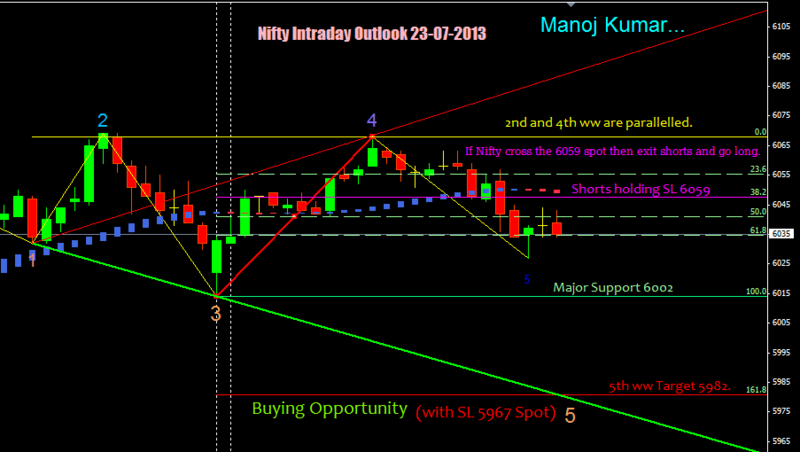 One can buy at this level with Stoploss 5967 (Spot) . If Nifty breaches the stoploss levels then immediately reverse your trade to positional shorts for a maximum target of 5859 spot. 4)If a slow downfall occurs, one can expect a dip to 5982-6002 spot levels. Then again expect a rally to break the present high. Manoj ji. You have confused us a lot like all technical analysts who give a vague picture that is you buy also and you sell also.. No clear cut confident call that nifty will reach 6150 or 5800..
@Ravi : Yes it is a view with various possibilities and high probablity strategies based on wolfe wave i guess.